Microsoft has released Windows 7 Beta more than 2 months ago to general public for free download. Although there is no more newer build been officially released, but the development on Windows 7 to perfect its features has been going on behind the scene, as evident in Windows 7 Build 7022 (64-bit download link) and Windows 7 Build 7048 that makes the round to the torrent sites. 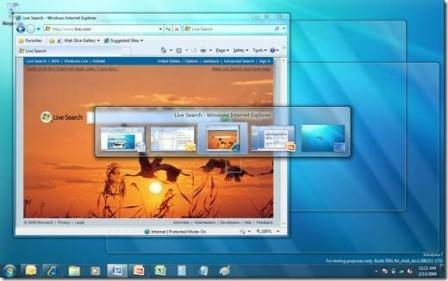 Microsoft also refined Windows 7 based on user’s feedback. Now, the list of new features and improvements have been published. Microsoft’s senior program manager, Chaitanya Sareen, has outlined 36 changes on Engineering Windows 7 blog that going to be included in Windows 7 Release Candidate (RC), and thus also in final RTM build of Windows 7. One can still quickly flip between and cycle through running windows using the ALT+TAB keys, but when more window information is needed Aero Peek will appear. This is triggered by a time delay as you pause while keyboarding through running windows. Pressing Windows Logo + <#> (where <#> corresponds to an item’s order in Quick Launch) can both launch and switch, with multiple windows switch support by repetitively pressing same hotkey. If you need a new instance for IE, simply use SHIFT + Windows Logo + <#>. A program’s Jump List may also be accessed via ALT+ Windows Logo + <#>. Finally, you can even flip back to the last active window of a program by using CTRL+ Windows Logo + <#> (this also works by holding CTRL with a mouse click on a taskbar button). See all new Windows 7 keyboard shortcuts. First, we changed the flashing animation curve to make it more noticeable (from a sine to a sawtooth wave). Second, we used a bolder orange color. Finally, we wanted to double the number of flashes which is currently set to three. As a nod to Windows 7, we decided to go with seven flashes instead. Hold down SHIFT and drop the file on the desired program. Squeeze in 24-39% more icons before the taskbar scrolls; depending upon your resolution, icon size and assuming the default notification area. Visual update that now keeps the color hot-track effect on when the mouse is over a thumbnail. When a program is installed, it is automatically and temporarily surfaced at the bottom of the Start Menu. The customer can easily discover this new addition, launch it directly and optionally drag it to the taskbar for convenient access in the future. Jump Lists only suggests a maximum of 10 items automatically (doesn’t apply to tasks or pinned items, with a setting for enthusiasts to customize the length of the list. Independent control to each so that one can opt to hide just her gadgets or just her desktop icons. First, the taskbar’s thumbnails now support a touch gesture so one can drag her finger across the UI and trigger Aero Peek. Also, the Show Desktop button is improved so a press-and-hold will allow the customer to peek at the desktop. A regular tap in both these scenarios still to commits the switch. Multi-touch support for the Touch Keyboard so that customers enjoy a more realistic experience, such as pressing multiple keys on keyboard. Fast new multi-touch gesture for right-click. Simply touch an item with one finger and use another finger to tap and summon a context menu. Customers are now able to drag/drop and select items with touch, even inside scrolling pages. The new behavior is optimized for the two most common actions by touch customers—scrolling up and down and dragging left to right. New overlay icon which now reveals when there is a local connection without internet access. Prompt for any modification made to the UAC Control Panel. High Performance power plan in the flyout menu when it is enabled under the Power Options Control Panel. New “Unsaved Theme” text to make tweaks and personalization a more predictable and enjoyable experience. Support to seek to a specific spot in the video in Windows Media Player or Windows Media Center for AVCHD content that was imported from a digital camcorder and support for Windows Media Player to natively support the .MOV files used to capture video for many common digital cameras. The content not supported to play will no longer appear in the library view so that there is better expectation of what is supported by the player. Possible to resume playback on content stored on physical hard disk after a laptop goes to sleep. The equalizer, play speed, SRS WOW and other options are now surfaced via the Now Playing context menu under Enhancements. Media Player’s Jump List provides quick access to the content customers consume. Fix audio streams did not properly move from the default speakers to their headphones. New header that updates to reveal the subfolder as one browses a library. Furthermore, the “Arrange by” views are better expose in the upper right, in proximity of the other view and search controls. Remove the ability to drag/drop a folder into the Libraries node in the Explorer navigation pane. Win+E shortcut opens an explorer window at the “Computer” path. Also changed is the link in Start Menu -> Username to match the Vista behavior. Local FAT32 hard disk drives were not support in libraries for Beta. Libraries will now support non-removable FAT32 and NTFS hard disk drives.